Two interesting books from the seemingly inexhaustible Martin Popoff publishing empire over in Canada. I was a little disappointed when I heard these were coming out, knowing that Nigel’s diary book was so close. I did talk it over with Martin and explained the situation and he kindly offered not to make more of these two than might otherwise have been the case. 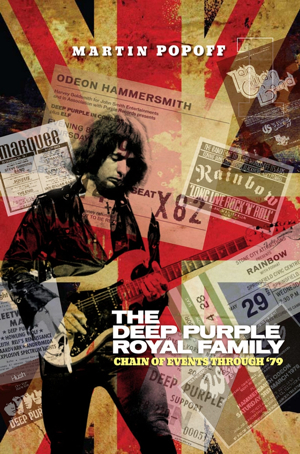 Basically each book covers a timeline of Deep Purple related events; book one goes up to 1979, the second volume concludes the saga. In fact they aren’t really a day to day diary at all, rather a basic chronology of tours and events, with a few specific happenings singled out. 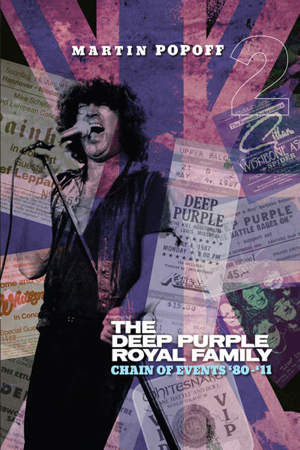 So Deep Purple’s Autumn 1974 US tour gets four lines of coverage. Indeed the main emphasis of both books is on the visual side of things, with a continuous stream of adverts, tickets, sleeves and other memorabilia (and the way he kicks it all off with the timeline of the electric organ is a nice touch!). The end result is visually very pleasing, and all being in black and white (and A5 size pages) it doesn’t matter that a few of the images are clearly off quite poor web sources (and clearly a lot of archive DP CD booklets have been raided along the way! ), as they’ve all tightened up quite nicely. What’s more, whilst I’m familiar with a lot of the material, away from the main bands there are some interesting pieces which I’ve not spotted before, including several Purple Records adverts. So I might end up going cap in hand to him for a few bits ‘ere long. Overall then two smart looking books with nice covers (one has IG on, the other RB, so there can be no falling out) which many will enjoy leafing through, but that in the end will serve mostly to whet the appetite for Nigel’s book. The titles are in stock with DTBOnline and as he often does for us Martin has kindly signed them all. His earlier two books covering the band’s history in written form based on his many interviews are also back in stock. Buying through DTB means the author gets a proper price for his work unlike some online retailers. I’m not so sure those books are Ok. You see, even the first American concert date for dp is wrong. All dates, or at least the vast majority of them are taken from American releases. From 1986 the information become scarce and not so interesting as on the previous years, some images and posters are from shows that didn’t take place, so I would suggest the author investigates a little more and checks out things before issuing anything. I was happy to contribute some scans for the second Royal Family book (although I didn’t get a credit!? !…) and these books are well worth picking up. So Simon… any idea when we can expect Nigel’s book? Going on what… 15 years now?